She looked at me with anguish. "My husband drinks! He's had all the so-called alcohol abuse treatment you can think of, but he just doesn't want to stop drinking, and you've got to want to stop, haven't you?" Samantha continued: "It's weird he doesn't even really drink much socially, it's after work, at the weekends, sometimes even at work I'm sure!" When I met Ken, her husband, he told me: "I am sick of feeling this way. It's like my life is held hostage by the booze and I just want some control back." Alcohol abuse treatment comes in various forms, from meds to counselling and of course rehab. You might not have access to any of these treatments right now, but there are things you can do for yourself. If you feel your drinking is out of control, I do recommend you seek help. Ken told me he thought alcoholism might be 'in his genes', as his father had been a heavy drinker and his father before him. This is a common assumption; that a gene for alcohol abuse gets 'passed on.' It may be much more a case of learned behaviour as no 'alcohol gene' has ever been found. Actually, social and psychological factors play a very large part in whether we drink alcohol uncontrollably or drink in ways that are safe and healthy. If you are really abusing alcohol (exceeding recommended units), you'll have noticed that you have been drinking when you told yourself you wouldn't. 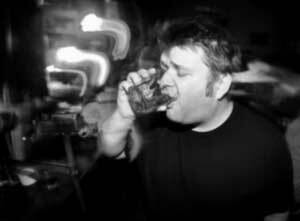 Your drinking may have interfered negatively with your work and/or social life and may also be affecting your health. Ken told me that he constantly promised himself that he wouldn't drink around his young kids but often he did and, understandably, his wife was getting increasingly angry about this. It felt liberating for Ken to finally admit to himself that he needed help; that his drinking was currently out of control. Think of the words we use to describe taking alcohol: A quick 'jar', a 'nip, bevy, wee dram' – we have affectionate terms for drinks and that's a problem. Seeing something as a supportive friend when it's undermining your very existence makes it all the harder to quit. Of course no 'friend' should be a problem. A thief may seem charming, companionable, and cute – but they are still a thief. Alcohol abuse means being abused by alcohol. You may have tried to make booze your friend, being convinced on some level that it will give you what it can't possibly, shacking up with it when times are tough. But a friend would never abuse you like booze does. What is lacking in your life that you need to hang out with a friend, dram, nip, whatever that steals health, time, self-respect, and possibly much more from you in such a shameless way? Once those unfulfilled needs are met appropriately, then alcohol abuse actually starts to diminish rapidly as a side effect of living well. Ken admitted to being very shy and felt like he'd started drinking initially to mask his diffidence. One strategy we used was to get him feeling more confident whilst sober. This gave him one less reason to feel like he needed the booze. So what needs might someone be trying to meet by drinking too much? A need to feel safe and secure: including a stable home life, a safe environment, and generally feeling calm and relaxed in yourself. Giving and receiving attention: real friends to give attention to and receive it from; friendships, fun, love, and physical intimacy. A sense of autonomy and control over our environment. If we feel too powerless in life, we may learn to misuse alcohol. But, of course, booze steals even more control from us. Being part of a wider community: feeling we belong and are connected to people around us. A sense of achievement that comes from stretching ourselves to achieve meaningful goals, however small. Seeing meaning and purpose in life: Some people start drinking too much as a way to blot out boredom or a sense of meaninglessness. A sense of meaning will come from learning, doing meaningful work, and meeting the need for achievement. Self-esteem, which results from having your basic needs met and learning to think more fairly about yourself. A sense of status within social groupings: feeling you have a respected role in life. Now, if we aren't even clear that we have to complete these needs appropriately to feel fulfilled, then all we will know is that we don't feel right. We know we need something but we don't know what it is. So we try to meet the need through drugs, eating when we're not hungry, or by abusing alcohol. This is like knowing the car needs something in the tank but not being clear about what it is, so you fill it up with sugar syrup. You might abuse alcohol as a way of trying to meet a need that remains unfulfilled in your life but problem drinking in turn makes it even less likely you'll meet that need in the way it was meant to be met. Pretty soon it prevents you meeting many other needs as well. Look at the list above. Are you more likely to abuse alcohol when you: haven't seen other people for a while (need for attention, intimacy, fun), feel bored (need for stimulation, being stretched), feel emotionally insecure (need for feeling secure and safe), or feel undermined by others (thwarted need for a sense of status)? Ken often felt shy without a drink inside him; shy people are not meeting the need to feel safe and secure. His wife earned more money than he did, so he felt low in the 'pecking order' (need for status). And many of his friends had deserted him because of his antisocial drunken behaviours, leaving him feeling isolated (need for connection). We really focused on getting him to start meeting his life needs healthily and, lo and behold, his drinking started to drop away. Of course, most of us go through times when our basic emotional needs are not being met well and we feel more vulnerable in these times. But being clear about what we need means we're more likely to be able to get what we need practically. It's when you feel a little vulnerable but still don't go running back to alcohol that you know great progress is being made. Ken still has bad times but as he says: "Now I don't have to abuse alcohol; I just find sober ways to deal with it!" One thing you can do right now is to think about this needs list. Revisit it daily if you like. And if needs are lacking (and if you are abusing alcohol, they will be), begin to work out how you can take practical steps to meet them for real. You'll notice that alcohol abuse actually tries to prevent you getting what you need in life. No real 'friend' should ever do that. Ken and his wife nearly divorced. But she has found her 'real man' again and last time I saw them together they looked like young lovers. "There were three in this relationship," said Ken, "and now the booze has gone, there's just Samantha and me." Click here to get Mark Tyrrell's tips to get control of your alcohol abuse, delivered in easily-digestible steps by email. If you'd like some extra help around Get Control of Your Own Alcohol Abuse my company Uncommon Knowledge provides a huge library of hypnosis sessions through Hypnosis Downloads.com. I have helped create all the sessions there and have listed related downloads below. Please let me know in the comments section below how you get on.